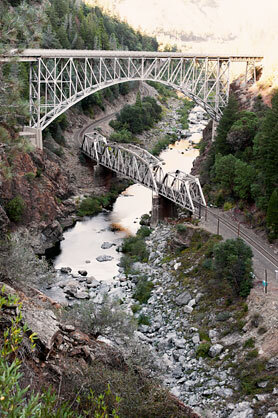 The two Pulga Bridges, one for highway traffic and the other for trains, cross over the North Fork Feather River. The highway bridge crosses over the railroad bridge. The 435 foot long railway bridge is a three span through truss bridge on concrete piers. 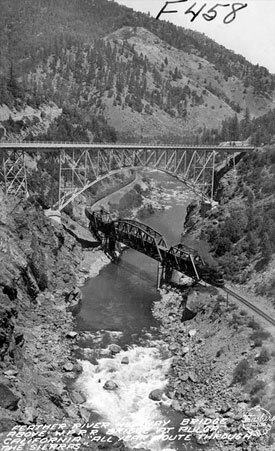 It was built in 1909 by Western Pacific Railroad on the route which connects the Sacramento Valley to Salt Lake City via the Feather River Valley. The railway, which crosses the Sierra Nevada mountains at Beckwourth Pass, is only half as steep as the Southern Pacific crossing at Donner Pass to the south. With a one percent grade, it the easiest railroad route over the Sierra Nevada. The steel arch highway bridge was opened to traffic in 1932 when State Route 70 was built. The longest span is 350 feet and the road bed is 170 feet above the railroad bridge. This portion of State Route 70 is part of the Feather River Scenic Byway, 130 miles of road carved out of the Feather River Gorge. Another pair of bridges, the Tobin Bridges, cross over the river about sixteen miles east of here on the scenic byway.